See the ordering from Japan page. Dennis AJ et al abstract: Trans-Abdominal Wall Traction as a Universal Solution to the Management of Giant Ventral Hernias. Plastic and Reconstructive Surgery, 2015; 135: 4, 1113–1123. 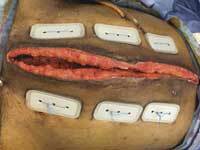 The Wittmann Patch is a hook and loop abdominal closure tool that is indicated for temporary bridging of abdominal wall openings where primary closure is not possible and/or repeat abdominal entries are necessary. Get more information on the Wittmann Patch. TAWT is a medial fascial preserving technique that uses the hook and loop Wittmann Patch to help close the acute open abdomen and reconstruction of giant ventral hernias. The technique helps avoid the need for component separation and bridging mesh. Get more information on the TAWT technique. Contact us for additional information about the TAWT technique. Retention Guard™ skin-protecting plates prevent suture pull-through, help protect skin, and anchor retention sutures in place. Get more information on Retention Guard plates. The XTAC is a short term (1 to 5 day) temporary dressing used to bridge the open abdomen. XTAC is an alternative to “off label” devices. It is soft, transparent, and pleated to accommodate swelling. Get more information on the XTAC. 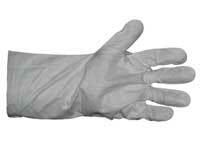 The burn glove is a protectant for partial-thickness hand burns and wounds. It speeds dressing changes and allows a greater range of motion during therapy than traditional gauze dressings. Get more information on the burn glove.